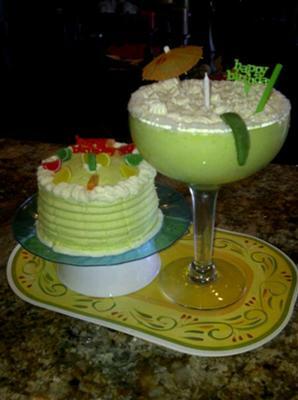 To make this margarita birthday cake, I used a white cake mix but substituted Stirring Margarita mix for water. I made buttercream, using the same reduced margarita mix so the flavor would be stronger, I saved a 1/2 C then lightly colored the rest green. I lined an extra large margarita glass with frosting and then layed cake and frosting. I topped with white frosting to look like froth, then lined the rim with sugar crystals. I then made a small layer cake for the rest of us, and added some gummy slices. My adult son asked for a margarita cake...joking because he didn't know I would do it!! This is a very creative way to make a cake and to complete a challange someone throws at ya!! I would like to have a big peice of that please! !